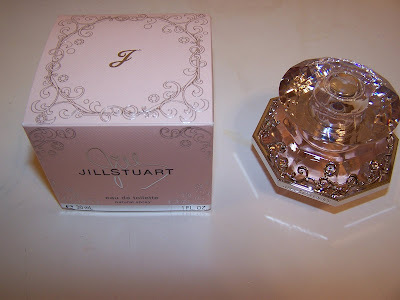 I wanted to do a review on the newest Jill Stuart fragrance for a while now but just kept pushing it towards the back burner. 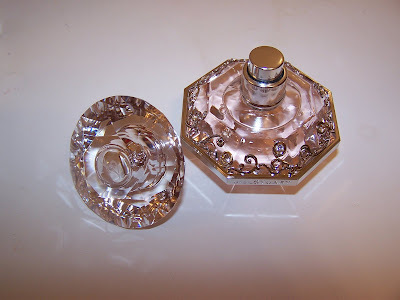 I’m not too good at reviewing perfumes which may be the main reason that I held off so long doing this review! But I finally decided to sit down and review this as it does indeed deserve a review all it’s own! It’s not really something you have to run out and purchase. 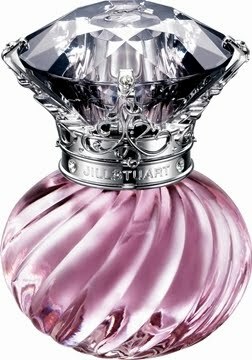 It’s by far the most beautiful in Jill Stuart’s perfume line in regards to the gorgeous bottle however the scent isn’t particularly unique or exciting. I’d really like to take a moment to say that the packaging on this is outstanding. The bottle is a heavy glass with beautiful silver etching all along the bottle with little diamonds embedded into the silver! The topper is lovely as well and equally as heavy as the bottle and shaped like a diamond. 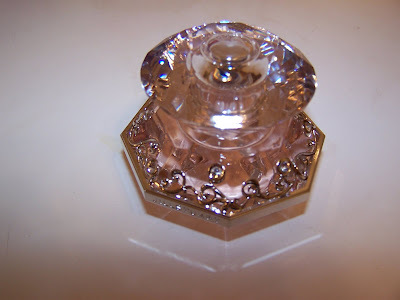 The entire bottle really lights up my vanity and matches perfectly with my other beautiful pieces from my Jill Stuart Cosmetic Collection (Click here and here to see more of my JS Collection). They really went all out on the bottle’s design and it’s just gorgeous. Sadly, the fragrance doesn’t match the design of the bottle! It’s nice enough I suppose but I expected something a bit more dramatic. It’s a very soft floral that contains notes of Peony, Green Apple, Lemon, Musk, Amber, and a few more bits. To be honest I thought it’d be more of a fresh scent in lending with the apple and lemon but it’s more of a light floral affair. To me it smells like some sort of floral shampoo. When I first spray it I get a bit of rose but after it dries down the Peony really is the deepest note that I’m smelling quickly followed by Gardenia. 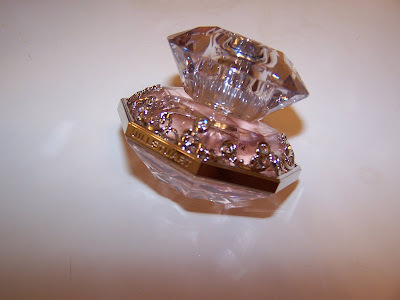 The fragrance is available in Eau de Toilette only but don’t let that sway you from purchasing as it does linger quite long and has a nice throw unlike some EDT’s which get sucked up by my skin and fail to linger. The smaller bottle I purchased was 4,800 yen while the larger bottle is 7,000 yen. Neither is too expensive for Japan. I’d expected it to cost much more Japan side so I was pleasantly surprised at the cost. With tax my small 30 ML bottle cost 5,040 yen, again, surprisely low for Japan in my opinion! All in all it’s quite good but not great. This isn’t something I can approve for purchase unless you’re a serious collector of Jill Stuart items. 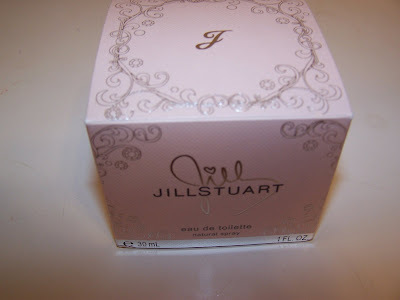 I purchased it because the bottle was so very lovely and I wanted it to compliment my Jill Stuart palettes and such but really you don’t need to run out to buy this as the fragrance really lacks the wow factor. This is a Japanese exclusive as far as I know so you can’t purchase it outside of Japan however at a later date who knows! Plus we have rumors abound of Jill Stuart winging her way to the US possibly soon!??!? I got this too and I have to agree that the smell is not too special. But WOW! The bottle sure is pretty! The bottle is amazing! It’s probably one of my prettiest bottles to date! It’s gorgeous 🙂 But sadly I agree the smell isn’t anything special! I must say I’m tempted to purchase the larger one too *blush* They’d look lovely sitting side by side lol! I have been DYING for this purfume as the bottle is stunning. i am not a purfume girl, I like Stella and thats about it. Do u recommend to me?Or is it really really blah? 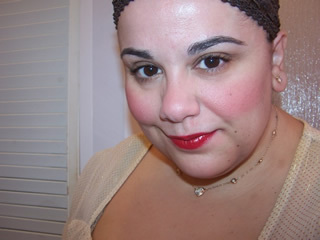 Muse, you are my favourite cosmetic blogger! it’s so detailed and helps me a lot when i make purchases. your swatches are great too! 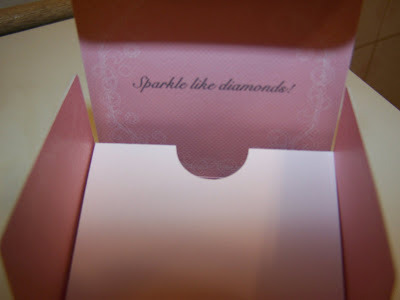 i was wondering… does this perfume smell like jill stuart handcream? i bought the fruity handcream and really liked the smell and was wondering if the perfume does the same thing. aw thanks milkmeo! 😀 you’re lovely! No hunny it does not. It’s considerably more floral where as the handcream is fruity and sweet. good to hear from you! Lucky girl 😀 It does NOT smell anything like the skincare. The skincare is a fresh, fruity type of scent but the perfumes are straight floral nothing at all like the skincare. I dunno if this particularly one is still available in HK since a brand new fragrance recently launched. US only have a very limited supply of makeup and not the fragrances sadly 🙁 Aside from the bottle this isn’t particularly special to go crazy for. I haven’t tried the newer scent but maybe that would be worth looking for. http://4.bp.blogspot.com/_MVfaMG2hO6k/S-gbJcZQmWI/AAAAAAAABhI/SKW_cNUmaNI/s1600/js_night+jewel.jpg <—this is the newest scent entitled Night Jewel. Followed your link to AlphaBeautyUK to scope out prices for the new Jill Stuart collection, found this & had to scope out a review; so far super tempted to buy it as I choose more floral perfumes (go with my skin so well, as anything remotely spicy or musky makes me smell like cat wee) but I was wondering if it’s possible to refill the bottle after it’s finished?